The final daily photo is posted and my year long adventure with Project 365 is done. Over 9000 images captured, averaging about 25 a day. I achieved all the goals I set out to accomplish with this project and much more. I have new friends from literally all over the world. I have discovered new photographers and their wonderful work, learning and borrowing plenty of ideas along the way. Thanks for your support, comments, encouragement and advice. Some have asked if I'm going to continue with taking and posting a new photo each day and the answer is no. The process was wonderful but at the same time it was demanding and consuming. So I'm going to take a break from trying to take a new picture each day. I will continue to post regularly using some of my older photographs and some new ones. 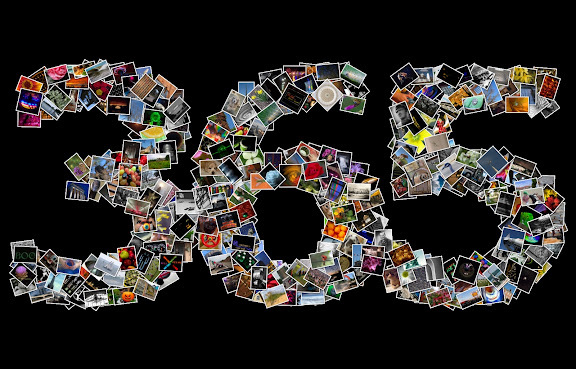 I hope you enjoy the collage of all 365 images it was made using Shape Collage Pro 2.5. I have enjoyed seeing your work during the past year, especially when it is some place familiar seen through different eyes. Glad you are not hanging things up completely and look forward to your new, more occasional postings. I have enjoyed getting to know you over this past year. This past year has been my first in blogging and is has been great meeting and getting to know fellow bloggers, especially from my area. Love the collage. Happy New Year to you. IT LOOKS AWESOME! Great choice for the finale! I am sorry it took me so long to log on and see it! Congrats on completing a tough goal! I love taking photos, but I can't imagine being motivated enough to make sure I took a shot EVERY day. I will be spending some time going back through your blog. What an impressive feat!